Local school districts with larger numbers of immigrant students will soon see more funding from the State of Iowa – at the expense of districts that do not. Senate File 472, if adopted, would increase the additional weighting of English Language Learner students from 0.22 to 0.30 equivalent students. This doesn’t change the amount of school funding from the state, but rather how it is distributed to the various districts on a weighted per-pupil basis. Each ELL student would be counted as 1.3 equivalent-weight students, instead of 1.22 equivalent-weight students for the purpose of establishing supplemental state aid for individual districts. That is a 6.56-percent increase in the weighting of each ELL student. SF 472 also increased the length of time students may be eligible for ELL programming from five years to up to seven years, if identified after the legislation goes into effect. This has the effect of increasing the number of years districts may request the added weighting for specific students. The additional weighting is meant to be a means of providing funding for the additional services and programming ELL students may require. State Sen. Mark Chelgren (R-Ottumwa), whose local school district has more than 4,000 ELL students, argued against the bill. He also offered an amendment to require in the Iowa Code that the funds received as a result of the additional weighting must be spent by school districts for ELL programming. Chelgren’s amendment failed on a voice vote. The overall bill was adopted, however, on a 28-22 vote. The Senate also adopted Senate File 476, which provides additional weighting for ELL students in school-operated preschool programs. That measure was approved on a 34-16 vote. The Iowa Health Information Network bill, Senate File 229, had a surprise opponent in state Sen. Herman Quirmbach (D-Ames), who argued for patient privacy, personal freedom, and less government intrusion. He also offered an amendment, which failed on a 30-20 recorded roll call vote, that would have required written notice anytime a patient’s information is searched by an insurer. Quirmbach had an even stranger ally in Chelgren, who urged Iowans to opt out of the program altogether. The overall bill was adopted, however, on a 46-4 vote. The Senate also adopted House File 203, a substitute bill for Senate File 337. The proposed legislation, if signed into law, allows for the licensing of polysomnographic technologists. Those medical professionals conduct sleep studies of patients who suffer from sleep apnea or other sleeping disorders. The bill, which was amended to include a requirement for background checks on applicants, was adopted without debate on a 37-13 vote. House File 146 – an act to prohibit insider betting, 49-0. House File 172 – an act to amend the powers and duties of nonprofit corporations, 50-0. 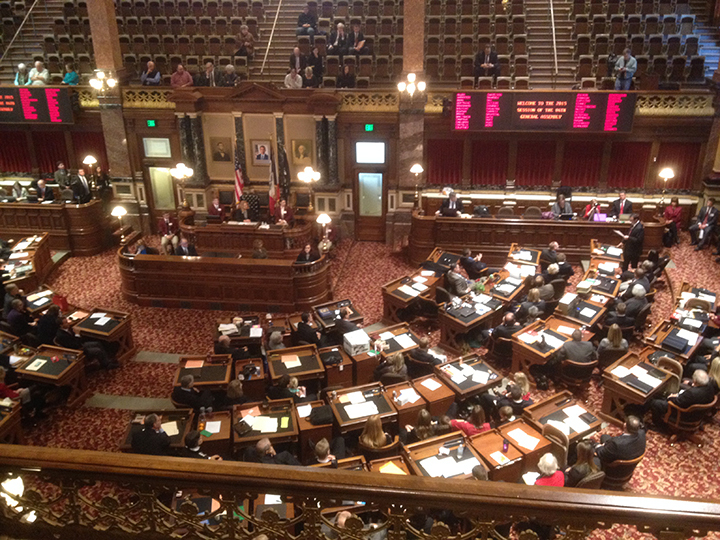 Senate File 482 – an act to amend Iowa Code as it relates to “social gambling,” 47-3. House File 227 – an amended version of the House bill, which allows for visual strip searches of anyone held in law enforcement custody for an offense other than scheduled violations, 50-0. House File 259 – an act to allow small business owners and corporate officers to claim exemption from worker’s compensation coverage, 50-0. House File 467 – an act to amend the fines for violations of deer and wild turkey harvest reporting requirements, 50-0.